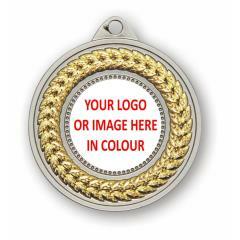 This academic medal provides you with a great way to recognize educational excellence. Featuring a golden lamp, book of knowledge & graduation cap, this academic medal is perfect to award all participants in any school competition or ceremony. Available in antique gold (shown), silver or bronze with your choice of ribbon colour.